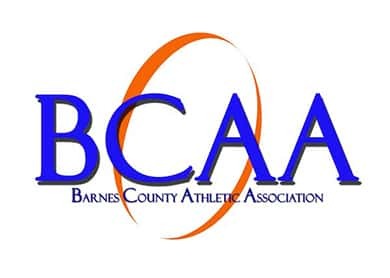 VALLEY CITY, N.D. (NewsDakota.com) – The 74th Annual Barnes County Tournament began on Tuesday with four games at the W.E. Osmun Fieldhouse on the campus of Valley City State University. In game one, Enderlin downed Griggs County Central 62-14. Milnor/North Sargent defeated Barnes County North 55-37. The Eagles held the Cougars to three points in the second half and no field goals over the final 9:14 as the picked up the win. Katelyn Tingley led the Eagles with 25 points, 15 coming after halftime. She added three steals defensively. Kaylie Schlecht was also in double figures with 15 points and three steals. Brooke Christensen chipped in six points, a team high six rebounds and a game high three assists. Jenna Larson led the Cougars with six points. Kennedy Hanneson had a team high six rebounds. Enderlin is now 2-1 on the season. Griggs County Central falls to 0-1. The Bulldogs outscored Barnes County North 27-9 over the second and third quarters which turned out to be the difference inthe game. Dylan Frederick scored 20 points to lead the way for the Bulldogs. Christina Mathias and Annika Nelson had eight points and five rebounds each. Victoria Sandness had a team high six defensive rebounds and four steals to lead the defense. Clara Wieland led the Bison with nine points, Bailey Soupir added seven points. Hallie Anderson had six points and Ashley McFadgen had six points, six rebounds and five steals. The three-time defending champs of the Barnes County Tournament had a convincing win over the Raiders in the third game of the day jumping out to an early 12-2 lead at the end of the first quarter and never looked back. Junior and three year starter, Ellie Holen had 16 points and nine steals, and Senior Olivia Bliss had 16 as well for the 2-0 Loboes. The Raiders were led by Sophomore Courtney Hovelson with 10 points. Maple Valley shot only 18% from the field and committed 28 turnovers and drop to 0-3 overall. In the only upset of the day, the No. 6 ranked Cadets defeat the No. 3 ranked Spartans by two points in the fourth and final game of the tourney. The game featured 10 lead changes and five ties, FSHP led by 11 at halftime. But the Cadets outscored the Spartans 32-21 in the second half to secure the victory and move into the semifinal round Thursday night against LLM. Both teams combined for 10 3-pointers, six by SC. 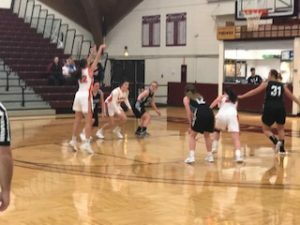 Leading the way for the now 2-2 Cadets was Junior Allison Peterson with 22 points, including five 3-pointers and the go-ahead trey with under a minute left in the game, Junior Brynn Peterson added 21 points. For the now 1-2 Spartans, Junior Josie Flaten had a double-double, 20 points and 10 rebounds. Rian Richards and Darby Breckheimer had 10 points each. All games will be broadcast on Q101 and newsdakota.com, starting about 2:45pm pregame.